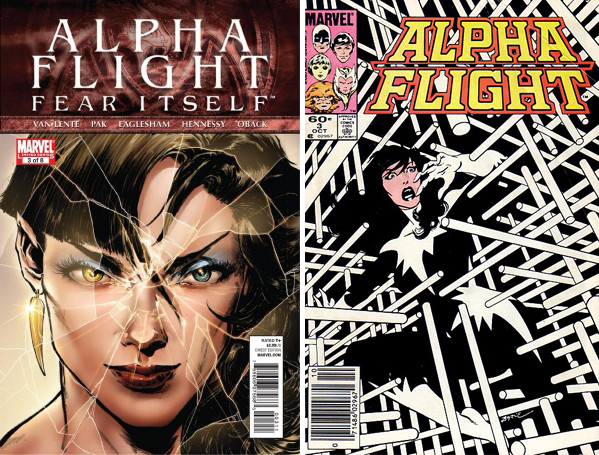 "At all times Alpha Flight should be considered powered and dangerous"
It's no coincidence the first time Alpha Flight #3 rolled round it featured Aurora/Jeanne-Marie in one of John Byrne's all time best covers, and the recent issue 3 of the current volume once again illustrates the mental volatility of Northstar's powerhouse of a sister, done by fellow living legend; Phil Jimenez. In this issue battle-lines are drawn. 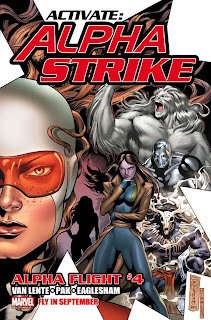 For those of you yet to step into writing duo Greg Pak and Fred Van Lente's take on the Canadian heroes, this issue is where the mini-series already rolling in the 'A' leagues took flight. Having been captured by Department H and the new Prime Minister lead 'Unity', the team bust free. However Jeanne-Marie had already volunteered to be 'unified' in the hopes it would end her years of mental instability and isn't that amused at being saved. Not that the Flight have time to notice. Out in the 'free world' even the army has turned against them, and with the Government using the media to blame Alpha for the events of Fear Itself and other atrocities, plus Vindicator - Guardian's wife, assembling Alpha Strike to hunt them down, this could well be the team's darkest hour. Aided by the matchless work of Dale Eaglesham (whose art hasn't looked this good since his time with the JSA) each character gets their moment. Sasquatch has to look for a plan B, Puck is still rattled after his time in hell, Marina actually makes attitude in comics look fresh and Shaman cracks a funny. Plus while I can't really remember that many issues where Guardian lead the team in the original series, pinning him as the central lead here, dealing with the set-up and losing his son to foster parents because of the probability of death occurring in his 'occupation' - is quickly making his stocks rise in my book. 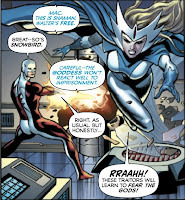 The issue's moment of cool is easily snatched up by the physical battle between Aurora and Jeanne-Marie. Using her speed to literally wrestle herself into deciding which side of the Unity divide she will stand on and as whom, the winner is decided in a way only slasher horror films can match. With the characterisation and drama turned up to 42, not only is Alpha Flight #3 an addictive read, it sure makes all aspects of this teaser for September's issue #4 make a hell of a lot more sense. That Byrne cover is one of my favourites too. Oddly he did one of Spidey that's nearly identical. I guess he liked the technique. Just looked that other Spidey cover up and you're right Robert - it is brilliant. And being for the pre Venom black and white Spidey, it's of my top wall-crawler era too!